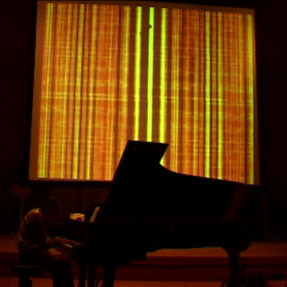 Free jazz improvisation by Guerino Mazzola over a motif of Modest Mussorgsky’s “Pictures at an Exhibition” accompanied by an expressive live visuals interpretation. Instead of using DSP music analysis, the piece employed real-time EEG (Electroencephalogram) to sense and analyse Mazzola’s brainwaves. The retrieved parameters were then mapped to for spatial distributions and movements of geometric shapes and to different color modulations. This entry was posted in Digital Art, Music and tagged Corebounce, Guerino Mazzola, Live Visuals, Matthias Specht, Pascal Mueller, Portfolio, Simon Schubiger on June 25, 2010 by robot.